Review Summary: The reunited Dinosaur Jr. extend their winning streak to three. When Dinosaur Jr. stormed back onto the indie rock scene with "Beyond" in 2007, they had the element of surprise on their side. No one expected an album from a bunch of aging indie rockers that hadn't played together in almost 20 years to be much of anything special, but when the album turned out to be an energetic affair that hearkened back to the band's late 80's heyday in terms of quality, the band was welcomed back to the music world with rave reviews and positive feedback of all kinds. In 2009, they followed their success up with an even better album, the epic "Farm", proving that "Beyond" was more than a fluke. Now, in 2012, with the release of "I Bet on Sky", that element of surprise that boded so well for "Beyond" and extended so easily to "Farm" has all but run its course. Now, since they have clearly proven that they are still more than capable of crafting great music, quality is to be expected from the reunited Dinosaur Jr. Luckily, "I Bet on Sky" succeeds in most places, though its praise may come with a bit less enthusiasm than its two most immediate predecessors. 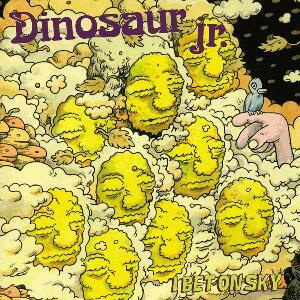 As far as the band's sound goes for "I Bet on Sky", its standard Dinosaur Jr. J Mascis is still bursting with guitar virtuosity, and his voice is as lazy and effortlessly charming as usual. Lou Barlow and Murph add their trademark dynamic to the sound with proficient performances, and, as the trend goes, Barlow contributes a pair of memorable tracks to the album. In other words, there is no mistaking this album as being third-era Dinosaur Jr., and it’s as immediately listenable, warm, and downright good as you would expect it to be. It’s the sound of a band that, for better or worse, has eased into a comfort zone of sorts. As this comfort zone suggests, Dinosaur Jr. push few boundaries with their latest effort. If anything, they seem to be attempting to straddle the differences between their first two albums of the era, as “I Bet on Sky” contains elements of the energized fun found on “Beyond” (“I Know it Oh So Well,” “Pierce the Morning Rain”) as well as the epic feel that permeated “Farm” (“Stick a Toe In”, “See it on Your Side”). Since neither of these moods are taken to their full potential, it feels like a little something is missing on “I Bet on Sky” which prevents it from becoming a top-tier Dinosaur Jr. album. Perhaps a track as exuberantly executed as “Beyond’s” “Almost Ready” or a sprawling guitar epic in the vein of “Farm’s” “I Don’t Wanna Go There” would give this album the chops necessary to compete with the classics in their discography, but nothing of the sort is to be found here. That being said, what is present on “I Bet on Sky” is wonderfully done in its own right. Opener “Don’t Pretend You Didn’t Know” is one of the finest tracks in Dinosaur Jr.’s impressive discography, as it comes out the gates with an easy-going riff that morphs into a classic J. Mascis solo, this time with surprisingly well-fitting keyboards splashed over the top of it. “Watch The Corners” is a solid single, and “Almost Fare” showcases the band’s dynamic with lackadaisical verses that take a dramatic twist into the chorus with fittingly dark stabs of a beautifully distorted guitar riff. As previously mentioned, Barlow contributes two highlights to the album as well, first with “Rode,” a song that almost sounds like a blend of punk and country with its driving rustic energy, and “Recognition”, which features a perfectly placed acoustic riff that splits the song into two halves and makes the piece feel quite a bit larger than its just under four minute run time would suggest. Other than these highlights, the rest of the album is very solid, and is never a chore to listen to. “I Bet on Sky” may best be described as the reunited Dinosaur Jr. extending their winning streak to three. While it may not be a top-tier album for the group, it is executed with a sense of effortlessness that makes it feel like the band could continue making albums of this caliber for a very, very long time. And even if it doesn’t progress their sound that much, it’s hard to fault Dinosaur Jr. for being Dinosaur Jr.- After all, Dinosaur Jr. is pretty awesome. i was disappointed with this after the awesomeness of their last two, but its still decent. Slight disappointment, then listened to "See It On Your Side" on infinite repeat. Problem solved. I liked Farm, Bug, You're Living All Over Me and Without a Sound. May check this out. Need a few more listens to decide why, but this one just doesn't grab me like their other albums. First two and last two tracks are great though. Seriously? Amazing, would love to see 'em live, but never even heard of them coming to the UK.